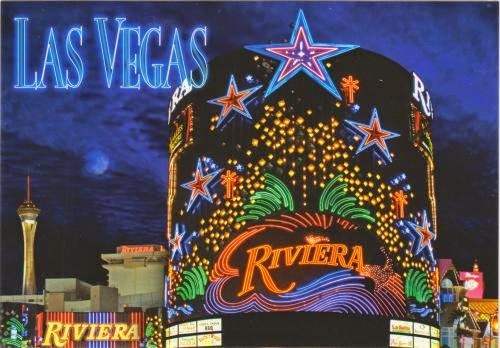 Postcard US-2520811 to Germany shows the Riviera Las Vegas, which is scheduled to close permanently tomorrow at noon on May 4, 2015. It just celebrated its 60th anniversary in operation on April 20, 2015. The 2,000-room hotel opened on April 20, 1955 as the first high-rise on the Las Vegas Strip. It was home to many legendary singers and performers such as Liberace, Frank Sinatra, Bob Hope, Elvis, Wayne Newton and Dolly Parton. The landmark casino and hotel was purchased by the Las Vegas Convention and Visitors Authority for about $190 million. The hotel will be imploded to make room for convention center expansion.